I went to visit my friend, Mary Redshaw, this month and catch up with her over a few pots of tea and a fish and chip lunch. I always enjoy this social time with this lady, who proudly displays all of the commission work that I have done for her (all beautifully framed and presented in her living-room). I always enjoy seeing her two ‘new’ dogs: one a Greyhound named Rio and the other a whippet named Tina. 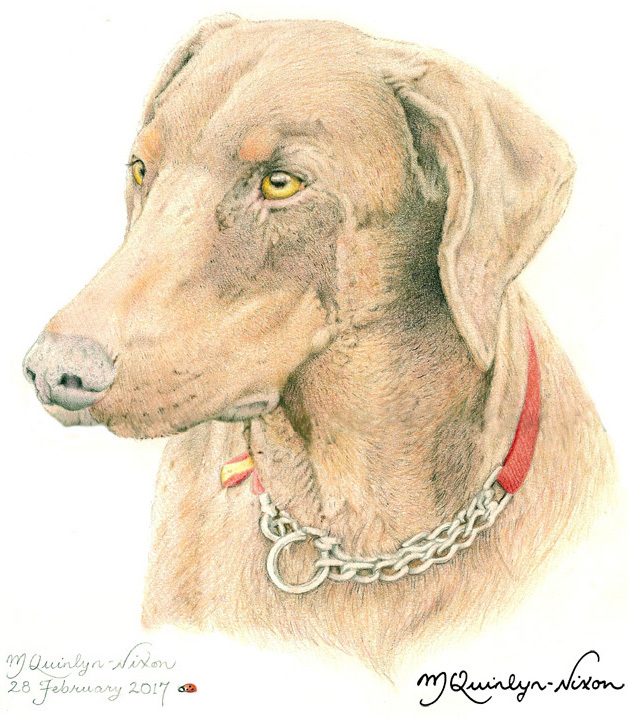 One of my favourite dog portraits I illustrated for Mary was the picture of her brown Doberman Pinscher – Tia, who was such a character. She certainly was a dog that knew her own mind and no amount of persuasion or commands could change her mind if she thought contrary to the request. I remember doing a mono illustration of Tia, as well as the colour…because I wasn’t sure which one I liked best… Which one would you choose? I am always delighted when a customer returns to me for another commission. It is an endorsement and validation that they appreciate the style and quality of my work and are happy to commission you to do another piece of artwork for themselves or a loved one. Last year, Mrs Angela Rose had commissioned me to create a birth illustration for a young relative, with a collection of dinosaurs. On this more recent occasion, she requested me to create a portrait illustration of her daughter’s two West Highland Terriers: Milly and Harper. I prefer to take photographs of pets myself, whenever possible, so I went around to do a photoshoot of the two canine characters. Both of these two dogs were in a rather soporific mood on a hot July day that they needed to look their best for the camera. They were both very well groomed, but their sleepy moments were interspersed with bouts of running, racing and jumping, as Mrs Rose’s daughter, Amy, and myself strived to keep them awake whilst I took numerous photographs. I have to say that both Milly and Harper were adorable in different ways, but I have a ‘soft-spot’ for Harper who gently raised her nose to touch mine whilst introductions were being made. 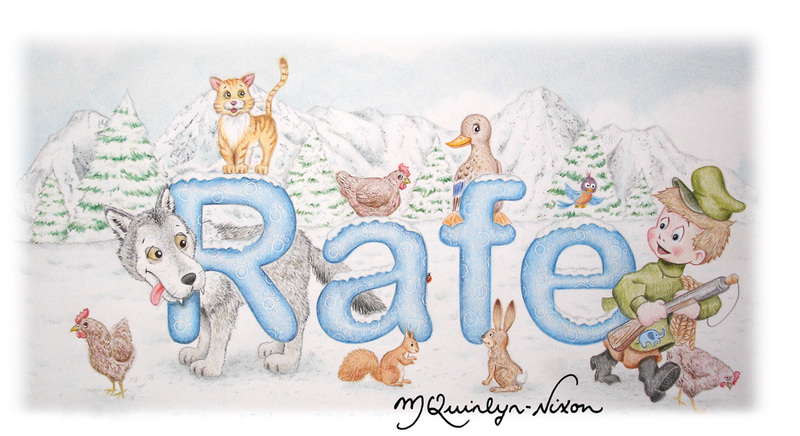 The illustration took a number of days to complete and required a background of fawn and soft browns to make Milly and Harper stand out. Whenever I am drawing ‘white’ dogs I am amazed to discover all of the different colours that go to make up the fur. These colours can include a range of browns, creams and fawns to name a few. I handed over the finished commission to Mrs Rose and her husband, Ian, and they commented that the illustration was “spot on” and that Amy would be delighted with her personal and unique commissioned illustration. I later heard that Amy was delighted and the commission will soon be displayed on her living-room wall. Thank you to the Roses and my other clients who return to me time-and-time-again for illustrations – it is very much appreciated.